Can You Go On Vacation? We’re heading into summer. As a business owner, this could be your busiest time of the year either for the business itself or the act of balancing work with your personal life. Kids are out of school, weather is warm, the sun is calling and you know your family is itching to go somewhere fun. You either feel a freeing sensation, or you feel trapped. Suffocated. You can’t possibly leave the business…. not now. If this is you, it’s time for a business makeover. 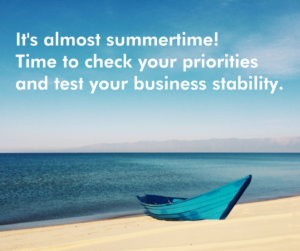 Schedule that vacation anyway, especially if you are not sure where the real holes are in your business. Start with maybe just one week, maybe two. See where the function of your business slows or even fails in that short time. Employees calling you to ask questions. This could be a sign that your employees are either ill-trained or they are not empowered to make decisions in your absence. Instead of giving them answers, ask them first what they think the right answer should be. Evaluate your own ability to delegate and empower them with confidence. Not only does this work against operating the business for years to come, to prospective buyers this is a red flag if these employees are going to stay with the business, or worse, you’re not. Someone looking to take over the business would most likely have you stay on for a transitionary period in this type of a situation, sometimes several years. Either way, you are not free to enjoy your vacation as you operate the business. Customers calling or emailing you with questions or worse, complaints. This is a bad sign customers are too dependent on you personally or have little trust in the capabilities of your staff. Analyze the questions or complaints carefully, and then address the team to see if they can help resolve the issues for next time or loop them in this time. Give them or even test their knowledge and capability of interfacing with these customers moving forward. Creating a wiki to cultivate know-how and a frequently asked questions document will also help train employees in how to best handle tough questions or complaints from customers. Dips in sales revenue. Uh oh. This could mean you are functioning as the number one sales representative in the business, or maybe your sales team is good with lead gen but you’re still acting as the main closer. Equip your sales team with your closing knowledge, skill and ability. Then stop selling. Let the team learn and do. They just might outsell you over time. Again, to raise ease of day-to-day operations and the value of the business, the steady stream of revenue cannot be dependent on you. Someday when you sell or you want to take a longer vacation, the stability of the cash flow will suffer. Accounts payable errors or in flux. You could have your hands too tangled into the accounting and financial leadership. A good business owner knows the numbers, but that doesn’t mean you sign all the checks and approve every expense. Hire a good accountant or even look at some outsource options to get a team with deep expertise and scalable capacity. Accounting is on the list of the top 15 things even small businesses can outsource, see related article here. Having a third party manage or simply audit the books will make your business more trustworthy and appealing. Learn more about the Entrepreneurs’ Organization, the only global network exclusively for entrepreneurs. EO helps leading entrepreneurs learn and grow through peer-to-peer learning, once-in-a-lifetime experiences, and connections to experts.